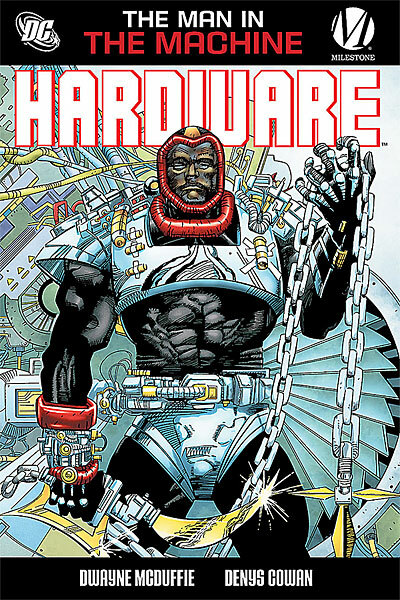 Let's wrap up Black History Month with a look at the debut title from Milestone Comics, Dwayne McDuffie and Denys Cowan's Hardware. (Yes, I realize February has another day tacked on this year, but that's my usual Wednesday Links day, so this is my last chance this month to do a review.) I'm actually going to just look at the trade paperback which collects the first eight issues of the 50-issue series. Sadly, it remains the ONLY collected edition of the title. The basic premise is that Curtis Metcalf is a genius employed by Edwin Alva, a very wealthy man who owns Alva Technologies. Metcalf uncovers Alva's illegal activities and, when the police and media ignore his evidence, he takes justice into his own hands by secretly building a high-tech super suit to take down Alva personally. Despite Alva having tons of money to hire all manner of bodyguards, Metcalf is fueled by something much deeper. I'll get to what that is in a moment. I've generally liked McDuffie's work over the years -- I think the first work of his I read was Damage Control -- but I have to admit to some trepidation upon opening Hardware and seeing the first story title as "Angry Black Man." I hadn't read any Milestone books before, so my familiarity with them was largely the general notion of a group of black creators making comics about black heroes. I wasn't expecting to see any reactionary or stereotypical type material that you might expect with, say, blacksploitation movies, but when "Angry Black Man" is thrown down in bold type on the title page as the grim, titular hero comes bursting through a skylight... well, I was a bit nervous about turning the page. Justifiably so, it turns out, as Hardware proceeds to blow up two manned helicopters and then forcibly pulls a pilot of a third through the cockpit window and throws him to the street from hundreds of feet above the skyscrapers. We then get the obligatory origin, establishing Alva both as Metcalf's savior/mentor and as his jailor. Metcalf is then fueled to go after Alva by a somewhat two-dimensional sense of vengeance, with a tinge of righteous indignation. He goes around saying that killing Alva will solve his problems and make things right, and proceeds to kill anyone who gets in the way of his mission. I was actually quite struck by how flat the character was, since I knew McDuffie was easily capable of much more. Although McDuffie set up the first few issues with this rather cold, shallow character and a pretty straight-forward plot, he also began developing his protagonist. The story, then, slips from being about Metcalf versus Alva into being about Metcalf versus himself. The hero's journey goes from being an external, physical one to an internal, mental/emotional one. Rather than trying to start the series with Metcalf as a fully rounded character, McDuffie threw his hero down as a blank slate and let the character grow organically as the story evolved. What appears superficially to be a tale about overcoming the yoke of "The Man" in fact turns out to be a fable about overcoming the yokes we place on ourselves! As I said, I'm reading this via the trade paperback so it came bundled in a nice chunk. I don't know if it would work as well in the individual issues on a month to month basis. That said, Milestone was providing a product that NO ONE else had, so I suspect their audience was willing to wait for the monthly installments. It seems very much like McDuffie would have liked to have released this as a series of graphic novels, but had to go the pamphlet route in order to make it financially viable. It makes me wonder if he was just a tad too early. It had a respectable run, sure, but what if it were introduced today as a webcomic with POD graphic novels every 120 pages? For as well as Milestone did in the 1990s, I bet they would really shot through the roof in the 21st century. Makes me wonder if someone should try to convince Christoper Priest and Olivier Coipel to try something online today. Here's the thing, though. Milestone was a group of black creators. Their characters were mostly black as well. But in both cases, that was only the color of their skin. Hardware isn't a "black comic". Curtis Metcalf is just a guy who put on a suit of high-tech armor. What McDuffie was, I think, trying to do was show people that what color the characters' skin was didn't matter; it could still be a good story that's approachable by anyone. A year ago, when McDuffie died, someone said the comics industry failed him. I took that to mean that he was always given the short shrift by publishers. That was certainly true, but the fans failed him as well. Hardware is a book that should have continued publication at least until his death. But fans said they didn't want "black comics" and didn't buy it, never bothering to see that it wasn't a "black comic"; it was a good comic. I love the novels of Walter Mosley, which not only involve black characters but arguably are "black novels" at least in that many of them overtly consider being black in a majority-white America. I know I'm far from alone in enjoying these novels, either. Mosley is a pretty singular talent, but still, could a comic connect with (part of) this same audience? I don't think it has happened, yet. If not, what to make of that? Arguably, Storm's had a prominent role in various X-Men titles for at least 25 years now. (Since the Claremont days when she sported a mohawk.) However, she's not THE lead character much of the time and has hopped around among the specific titles of the franchise. Ray Billingsley's comic strip Curtis has been around since 1988. Although it's certainly not the most popular comic strip and newspaper sales have been on the decline, I suspect it still has more readers than any X-Men title. But that it's A) hard to come up with any reasonable answers at all, and B) only possible to go back a couple of decades highlights just how bleak things are. Good answers! I figured that's what I would get, though!